So, these posts are a bit out of order. 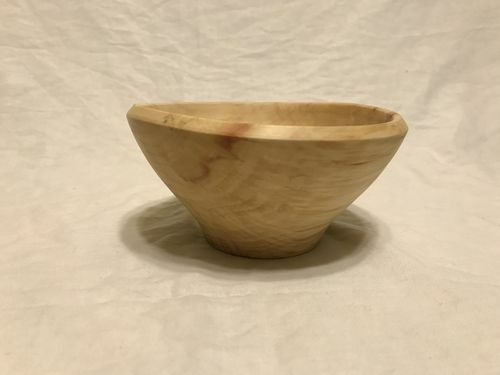 I took a Green Bowl Turning class at the Minneapolis Woodcraft in January. Great class, and Dan Larson was a terrific instructor. It was the first time I had used steel tools (the home shop is pretty much 100% carbide), and only the second time I had ever turned green wood. The bowl gouge was alternately frustrating (when I had my angle off and tore a chunk out of the rim of my bowl) and rewarding (nothing like a long ribbon of fresh box elder streaming off a blank). I am not ready to buy a grinder and a pile of steel turning tools, but it has already made me better with my carbide tools, and I have played with my bowl gouge and scraper at home. This is the bowl I made in class. It was intended to be at least a 1/2” taller (see above frustration – lol), but it turned out pretty well.